Have you ever walked into a Starbucks and seen a bunch of millennials sipping expensive lattes as they type on their super-thin (and often fragile) laptops? Please know that is not the only way people work with computers. Actually, there are many hardworking men and women that do downright dirty jobs in the field -- a thin laptop and a fancy latte just won't do. These folks need a normal cup of coffee to go and a laptop that can withstand abuse. For many years, Panasonic has been producing its "Toughbook" line of computers for the blue-collar workers that make the world turn. The company's machines can take a beating, making them ideal for first responders, construction workers, the military, and more. While they may cost a bit more up front, they can pay for themselves over time as they survive when other computers will have already died. Today, the company refreshes its famed 10.1-inch "Toughbook 20" 2-in-1 Windows 10 detachable laptop/tablet with a new 8mp rear camera, a bridge battery, plus updated processor and storage options. "At only 3.9 pounds, this fully rugged laptop is perfect for today's workers on-the-go, with the features and rugged construction to keep working, no matter what challenges it meets. Now equipped with a refreshed processor -- the Intel Core i5-7Y57 processor with Turbo Boost up to 3.3GHz, the Toughbook 20 laptop is more capable than ever before. And with a 256GB SSD standard on all models -- and an option to expand to 512GB -- workers can store more data on the go and access it with the speed they need," says Panasonic. The company further says, "Panasonic Toughbook customers often find themselves away from power sources for extended periods of time. For them, battery life isn’t a convenience, it's a necessity to get the job done. Toughbook 20 supports an optional second battery that can be inserted into the keyboard to double battery life. Additionally, Toughbook 20 now comes standard with a 'bridge battery,' making it possible to hot swap charged batteries, effectively providing unlimited battery life without the need to shut down or hibernate for our most demanding users." 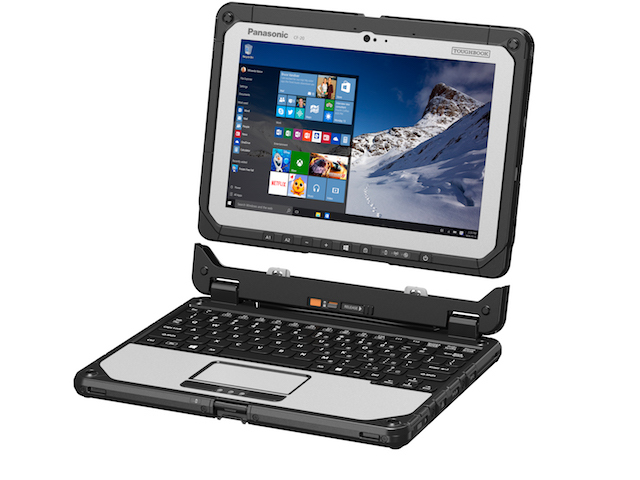 This new Toughbook 20 model featuring an Intel Core i5-7Y57 processor can only come equipped with Windows 10. Quite frankly, in 2018, that is the best version of Microsoft's operating system. If you prefer Windows 7, you can still get that option, but it is limited to the Intel Core m5- 6Y57. If you do decide to go with the better processor and Windows 10 (just do it), the newest Toughbook 20 is available today with pricing starting at $3,099. Ready to order? You can email Panasonic at sales.psc@us.panasonic.com.